This is the overall programme for the General Assembly. See the full Congress programme at the FIG Congress 2018 web site. This session is reserved for Presidents or Heads of delegation (or their representatives) of member associations to discuss issue of their common interest. This online version of the agenda includes link to all appendices in .pdf. IIn addition to this on-line version, the agenda and its appendices will published as one large .pdf file. Note: Revisions are shown only on the .htm version of the agenda and marked with colour. Note: Revisions are shown only on the web version of the agenda and marked with colour. The individual appendix files can be downloaded below under each item in pdf format. PLEASE NOTE: In 2018 FIG Office has sent invitation and agenda only by email. Full agenda without and with all appendices can be downloaded from this web site. We encourage you to use the online edition or otherwise to print the .pdf version. Changes to the agenda after it was originally distributed by email to the member associations are marked in this agenda with colour and date. President Chryssy Potsiou to open the 41st General Assembly. Please note: The roll call will be done for member associations only. Delegates representing affiliate members, academic members, corporate members and correspondents as well as honorary presidents and honorary members will be entered in the records, but they shall register before the meeting starts at the meeting venue to the staff of FIG Office. Member associations are asked to inform the FIG Office by 16 April 2018 about their attendance, at the same time to submit the names of their delegate(s) and to inform who their Head of the delegation is, if it is not the President or Chair. Please use this special link below to inform us about your delegation. Since only member associations that have paid all their membership fees to the end of 2016 are allowed to vote at the meeting. A list of member associations that are not allowed to vote will be published and posted on the FIG web site 26 April 2017. Motion: That members present are recorded in the minutes. Motion: That the General Assembly appoints Muzaffer Kahveci from Chamber of Surveying and Cadastre Engineers of Turkey and Hoang Kim Quang as tellers for this General Assembly. The General Assembly was announced as mandated, two months prior the general Assembly by email and on FIG web site, and the Agenda for the General Assembly was also published on the web site and by email to all members. Motion: That the agenda be adopted. Minutes have been circulated previously. Appendix to item 5: Minutes of the General Assembly in Helsinki, Finland, May/June 2017, without appendices. Motion: That the minutes be adopted as recorded. FIG Council has so far accepted no applications for member association since the 40th General Assembly. FIG Council has received one application that will be included in the Council meeting on 4 May 2018. General Commission for Survey (GCS), Kingdom of Saudi Arabia has applied for association membership. The association was established in 2006. Their total membership (all categories) is 328 General Commission for Survey (GCS), Kingdom of Saudi Arabia fulfils the criteria of FIG member association. Motion: That the General Assembly admits General Commission for Survey (GCS), Kingdom of Saudi Arabia to become a member association of FIG. Colegio de Ingenieros Topógrafos de Costa Rica has unfortunately decided to resign from FIG. FIG thanks for their membership until the end of 2017. Motion: That the General Assembly notes the update. The General Assembly has power to expel from the Federation any member association whose fees are in arrears and shall under normal circumstances expel any member association whose fees are three years in arrears. (Article 4.3 of the Statutes). The FIG office has sent information to these associations informing that if their membership fees are still in arrears at the time of the General Assembly the General Assembly shall expel the above member associations in Istanbul. FIG office has now received payment from Order of Land Surveyors Expert. (O.G.E.F), Algeria, MA-10001 and the association will therefore not be expelled. FIG office has now received payment from the association and The Institute of Surveyors Inc. ISSL will therefore not be expelled. After acceptance of new member associations and before expulsions the number of FIG member associations is 103 from 89 countries. If no payment has been received before the General Assembly takes place. the Order of Syrian Engineers and Architects, OSEA as all efforts to maintain contact with them has not yielded results and will deem their membership in suspension giving due consideration to its internal situation. Iranian Professional Society of Surveying Engineers (ISS) has paid their membership fee and has now returned to normal membership status. The situation with these associations will be reconsidered by Council again in 2019. Motion: That the General Assembly notes the members with suspension status. There have been two applications for affiliate membership since the General Assembly 2017. After these changes the number of Affiliate members is 43 from 41 countries. After these changes the number of corporate members is now 27. The number of Academic Members after these changes is 84 from 50 countries. Jean Pierre Habiyaremye, Rwanda The number of correspondent members is now 4. Motion: That the General Assembly notes the actions that the Council has taken with other membership matters. President Chryssy Potsiou has prepared the President’s report on the activities of the Federation since the General Assembly in Helsinki, Finland, May/June 2017. Motion: That the General Assembly accepts the President’s report. Mr. John Hohol, President of the FIG Foundation has prepared a report on the FIG Foundation activities from May 2017 to March 2018. He will make a short report to the General Assembly. Motion: That the General Assembly adopts the report of the President of the FIG Foundation and records its thanks to the President and members of the Board of Directors of the FIG Foundation. Dr. Christiaan Lemmen, Director of OICRF has prepared a report on the OICRF activities since the General Assembly in Christchurch. He will make a short report to the General Assembly. Motion: That the General Assembly adopts the report and records its thanks to the members of OICRF for their past year’s work and contribution. Mr. Jan de Graeve, Director of the IIHSM, Mr John Brock and Mr Jim Smith have prepared a report on the IIHSM activities since the General Assembly in Helsinki. IIHSM will make a short report to the General Assembly. Appendix to item 9.2: Report from the International Institution for the History of Surveying and Measurement, Permanent Institution of FIG. Motion: That the General Assembly adopts the report and records its thanks to the Director and the members of the permanent institution for their past year’s work and contribution. FIG has currently two Task Forces. The Task Force assesses the progress of establishing the real property markets in the countries with economies in transition. The Task Force is chaired by Pekka Halme, Finnish Association of Geodetic and Land Surveyors MIL. A session on Real Property Markets is included in the technical programme. Motion: That the General Assembly adopts the report from the Task Force and records its thanks to the Chair of the Task Forces and their members. The Task Force is established to strengthen the FIG relationship with corporate members. The Task Force is chaired by John Hohol, National Society of Professional Surveyors (NSPS) in cooperation with Bryn Fosburgh, Vice President of Trimble. FIG Young Surveyors Network is currently chaired by Ms. Eva-Maria Unger, Austria. She will give a status report on the activities of Young Surveyors Network. Based on the changed election structure reported at the FIG General Assembly 2017, the Young Surveyors have appointed a new Chair for the term 2019-2020, Ms Melissa Harrington, which has been approved by FIG Council. Motion: that the General Assembly notes the report and succession plan and records a thanks to the chair for her term of office 2015-2018, and a thanks to all the many active Young Surveyors. Each Network Chair has submitted a written report on their Network activities since the FIG Working Week in Helsinki. Each Network will give a short report on the Network activities to the General Assembly. Motion: that the General Assembly notes the reports and records a thanks to the chairs of the network. Each Commission Chair has submitted a written report on their Commission activities since the FIG Working Week in Helsinki. These reports include progress reports of the Commission working groups. Each Commission will hold a meeting during the Working Week (Tuesday 8 May, 17:30-18:30). Each Commission will give a short report on Commission activities to the General Assembly. Two prizes have been introduced. The magazine Survey Review offers a biennial prize to a FIG peer review paper. There will be a trial period for 2018 and 2020 In 2018 selection will be among the successfully peer reviewed papers. Last year Commission 5 introduced the NavXperience Award that again in 2018 will be given to a selected Commission 5 paper. The prize winners will be announced at the General Assembly. Motion: That the General Assembly: adopts the reports of the Commission Chairs and records its thanks to the chairs and other officers of the Commissions for their ongoing contributions. Based on the Task Force Recommendations, comments and feedback from the members, the President established a new group of volunteers among the members to contribute to the definition of a Terms of Reference for a future Working Group on a review of the overall FIG Governance. And that these Terms of Reference will be presented at the General Assembly 2018 on 6 May. Council action will be to establish of a group to work on the ToR. The current council suggests to let the incoming Council establish this group. Motion: that the General Assembly notes the Terms of Reference and Council action. Since the 40th General Assembly, FIG has continued to collaborate with the World Bank and various agencies and structures within the United Nations. Participation to FAO and the Voluntary Guidelines, VGGT. At the Congress 2018 there will be three sessions in cooperation with FAO: FIG Academic Forum a special session on Land Consolidation and a session on VGGT. UN-Habitat/GLTN-Young Surveyors Volunteer Community Surveyor Programme VCSP. VCSP is an innovative volunteer program that is a powerful driver for both social impact and professional development. The VCSP leverages on the skills, experience, talents and education of young surveyors, matches this competence with the needs of GLTN, particularly in GLTN’s county level implementation plans and programs. 13 Young Surveyors from Senegal, Nigeria, Nepal, New Zealand Uganda, England, Namibia, Australia and Zimbabwe have successfully been working on GLTN Projects for 2-4 weeks in DR Congo, Kenya, Nepal, Uganda, Philippines and Zambia. FIG Publication 52 FIG Publication no 52 The Social Tenure Domain Model - A Pro-Poor Land Tool on Social Tenure Domain Model. FIG Report, 2010. Participation at the World Bank Conference in March 2018. World Bank and FIG have organised two special sessions at the FIG Congress 2018. The Joint Board of Spatial Information Societies JB-GIS was formally established during the FIG Working Week in Cairo in 2005. The name was in 2017 changed to UN-GGIM-Geospatial Societies. The Geospatial Societies meet annually during the United Nations Committee of Experts on Global Geospatial Information Management meetings. The meeting of UN-GGIM-GS in 2017 was held in August 2017. The Geospatial Societies also met in Prague in August 2017. FIG has collaborative MoUs with a number of the organizations who are part of the Geospatial Societies. FIG has further bilateral agreements of co-operation with several other international associations like ISM, IFHP, CIB, ION, ICEC, FIABCI, IFHS, PAIGH and PAQS. 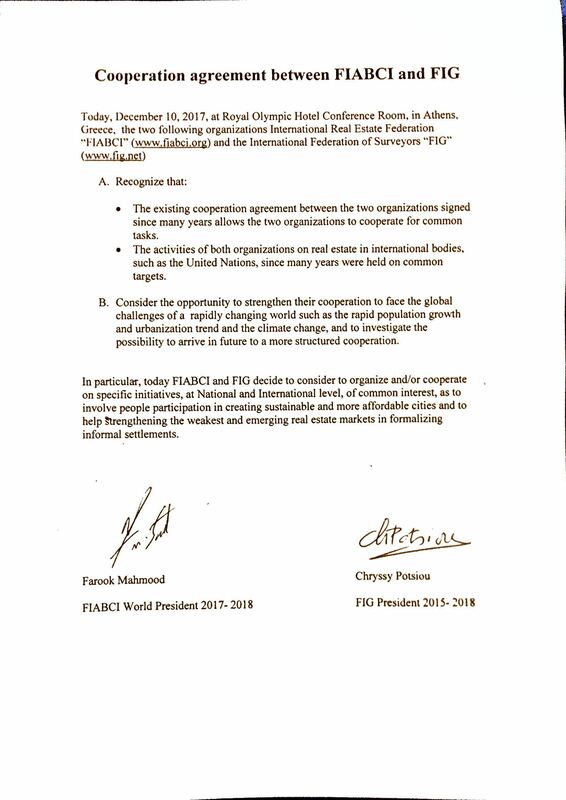 iN December 2017 FIG President signed a renewed Cooperation Agreement with the International Real Estate Federation, FIABCI. FIG is represented in the International Construction Measurement Standard Coalition by Chair of FIG Commission 10, See Lian Ong who has been appointed chair of the Standard Setting Committee. FIG is represented in the Trustee Board by the President. FIG is represented in International Land Measurement Standard Coalition by Mr. Maurice Barbieri. In 2017 FIG Council decided to join the Ethics Standard Committee. FIG is a member of the International Council for Science (ICSU) and is working together with ISO and International Valuation Standards Committee (IVSC) on standards. CLGE and NSPS initiated the first Global Surveyors day on 21 March 2018, supported by FIG, and this was launched during the World Bank Conference in Washington. Motion: That the General Assembly records the report on the liaison with other international associations. There are several publications under preparation and some of these will be ready by the Congress in Istanbul and the rest by the end of 2018. Motion: That the General Assembly records the publications for inormation and records its thanks to editors and authors of these publications. Vice President Rudolf Staiger will present the report to the General Assembly. This report includes the auditors report from 2017, official accounts (income statement 2017) and balance sheet 31 December 2017, a summary of 2017 accounts, an updated budget for 2018 and proposals for budgets 2019-2021 and proposal for membership fees for member associations in 2020. 18A Auditor's Report, Income Statement for 2017 and Balance Sheet at 31 December 2017. The General Assembly has to set levels of fees for member associations two years in advance of the year in which they become payable. Fees are payable in respect of each individual member up to a maximum of 5,500 members. The membership fee structure was changed in 2009. Membership fees have been discussed as part of the finance report, appendix to item 17. The 2018 subscription fees were kept at the same level as for the years 2012-2018, and General Assembly agreed to increase the fee with 8% for 2019. Since increase has been made for 2019, Council suggest keeping this same rate for 2020. Member associations from countries listed by the World Bank as low-income economies or lower-middle-income economies shall pay €2.40 per member up to a maximum of 5,500 members. The General Assembly decided in 2016 to postpone the election of Commission Chairs (Elects) until 2018 due to the work that was being done by the Task Force on Commission structure. Thus, the General Assembly shall appoint Commission Chairs Elects for the term of office 12 May 2018 until 31.12.2018 and these Chairs Elects will then become Commission Chairs for the term of office 2019-2022. One application was received late and therefore unfortunately rejected. As there were no nominations for Commission 2 and Commission 4 Council has discussed about the situation and has decided according to the FIG Statutes that the positions will be appointed by Council. The elections will take place at the second session of the General Assembly by blind votes in on Friday 11 May 2018. Motion: That the General Assembly notes the presentations and decides to make the election at the second session of the General Assembly on the 11 of May. The profile templates of each candidate are attached to this agenda. In the first session of the General Assembly each candidate will be given equal time (not more than 6 minutes which will be timed) to introduce her/him and make a presentation focussing on his/her ideas and goals for developing the FIG agenda to the General Assembly. The elections will take place at the second session of the General Assembly by blind votes in on Friday 11 May. The elections will take place one position at a time. If there will be no absolute majority in the first voting, second vote will be organised between those two candidates that have most votes. In the first session of the General Assembly the candidates will be given time (not more than 10 minutes) to introduce themselves and make a presentation focusing on their ideas, goals and agenda for furthering FIG’s objects and global stature. The election will take place at the second session of the General Assembly by blind votes on Friday 11 May 2018. The FIG Congresses are organised by FIG together with a local member association. FIG will together with the local member association have full responsibility of the arrangements and of the financial result. This offers FIG better opportunities in terms of organising events and generating revenue. Therefore the Council has to ensure that all candidates are aware of the role of FIG and split of responsibilities for organising the Congress. This General Assembly will decide on the host for the FIG Congress 2022. The FIG Council has received two bids to host the FIG Congress 2022, and FIG Council thanks all bidding member associations for their special engagement and contribution to FIG. The summary report will not give a recommendation or a preference to any candidate but it will provide useful information on each items listed above and summarise the pros and cons of each candidate to assist the member association in making their decision. The General Assembly must note that, especially in these past years, the issue of security and financial viability has come to the fore. The purpose of the evaluation process is to maintain the continued viability, high standard and quality of the FIG Congrfess. The General Assembly is recommended to read the summaries and the bids carefully. At the session each candidate will be given the same time (not more than 10 minutes, will be timed) to make a presentation of their proposal and framework of the Working Week and their bid. Decision on the venue of FIG Congress 2022 will be made at the second session of the General Assembly on 11 May. The voting will be made by blind votes. Motion: TThat the General Assembly notes the submission, the summary report and the presentations, makes its careful consideration and decision during the second session of the General Assembly on 11 May. Separate invitation to Presidents of the Member Associations. Please note: The roll call will be done for member associations only. Delegates representing affiliate members, academic members, corporate members and correspondents as well as honorary presidents and honorary members will be entered in the records, but they shall register before the meeting starts at the meeting venue to the staff of FIG Office. Please note that only member associations that have paid all their membership fees to the end of 2017 are allowed to vote at the meeting. A list of member associations that are not allowed to vote will be published and posted on the FIG web site 16 April 2018. To be noted that the General Assembly has appointed two representatives as tellers. Tellers: The tellers will represent the member association hosting the current General Assembly (MIL/MAKLI, Finland) Martti Pietikainen and the host of the proceeding following General Assembly (Chamber of Surveying and Cadastre Engineers of Turkey) Muzaffer Kahveci. Motion: Those members present are recorded in the minutes. The Council will decide on other membership issues, if any, considered in Istanbul and bring them for the General Assembly for decision or information as necessary. FIG Council has received an application for membership from Afghan Surveyors Association (ASA), Afghanistan. This application was discussed at the FIG Council meeting during FIG Congress 2018 and council decided to bring this application forward to the General Assembly. The association was established 2 April 2018. Their total membership (all categories) is 185. Afghan Surveyors fulfils the criteria of FIG member association. Motion: That the General Assembly admits Afghan Surveyors Association, ASA, Afghanistan to become a member association of FIG. Association Professional Surveyors of Liberia was expelled at the General Assembly 2017. Liberia has now paid their remaining arrears and are therefore reinstalled as member. The number of member associations after expulsions and admittance of new members is 105 from 91 countries. The number of affiliate members is after the updates 45 from 43 countries. The number of Academic members is after the update 86 from 52 countries. Motion: That the General Assembly decides on the membership issues based on the proposal of the Council. According to the FIG Statutes and Internal Rules the General Assembly shall elect Commission Chairs Elects. These Chairs Elect will then become Chairs of the Commissions for the next term of office, 2019-2022. Thus the General Assembly shall appoint at this meeting Commission Chairs for the term of office 1.1.2019-31.12.2022. Their respective nominating member associations have reconfirmed all nominated Chairs 2019-2022. Because there is only one candidate for Commission 1, 3, 5, 6, 7, 8, 9, and 10 these candidates will be elected through a simple voting. For commission 2 and 4, as there were no nominations, Council has appointed Chairs for these positions and is bringing these two chairs forward to the General Assembly. appoints the Chairs Elects for Chairs for the term 2019-2022. The elections will take place by blind votes following the FIG statutes and internal rules. The elections will take place one position at a time. If there will be no absolute majority in the first voting, second vote will be organised between those two candidates that have most votes. Motion: That the General Assembly elects two Vice Presidents for the term 1.1.2019-31.12.2022. The election will take place by blind votes following the FIG statutes and internal rules. Motion: That the General Assembly elects the President for FIG for term of office 1.1.2019-31.12.2022. The decision will take place by blind votes following the FIG statutes and internal rules. Motion: That the General Assembly decides the host and venue for FIG Congress 2022. During the Congress there will be Member Association Forum, the Director General’s/Affiliate Members Forum, Academic Members Forum, Regional Bodies Forum and Corporate Members Meeting. They may report back to the General Assembly on any issues that may need the endorsement of or are of general interest to the General Assembly. FIG Commissions will have their annual meetings, administrative meetings and technical sessions during the Congress. They may report back to the General Assembly on any issues that may need the endorsement of or are of general interest to the General Assembly. Any other activities from the Congress may be reported back to the General Assembly on any issues that may need the endorsement of or are of general interest to the General Assembly. Motion: That the General Assembly records the report(s). Networks, Task Forces, Permanent Institutions, FIG Foundation and others will have meetings and technical sessions in Christchurch. They may report back to the General Assembly on any issues that may need the endorsement of or are of general interest to the General Assembly. Any other activities from the Working Week may be reported back to the General Assembly on any issues that may need the endorsement of or are of general interest to the General Assembly. Any other issues that the members want to raise for discussion. Motion: That the discussion will be recorded and the Council will consider action that will be required. Representatives from the Local Organising Committee from Licensed Surveyors Association of Ghana and Ghana Institution of Surveyors will give a presentation on preparations of FIG Working Week 2021. Motion: That the General Assembly records the report. Representatives from the Local Organising Committee from Geo-Information Netherlands, GIN will give a presentation on preparations of FIG Working Week 2020. Representatives from the Local Organising Committee from the Vietnam Association of Geodesy - Cartography - Remote Sensing will give a presentation on preparations of FIG Working Week 2019. Data supplied by the FIG Office. Whilst every effort has been made to ensure that this data is accurate errors might exist. Requests for updates and corrections should be emailed to the FIG Office.